The openGlobalRights debate on internationalizating human rights groups has inspired a flurry of commentary on this “new” trend, but decentralization is not new to ActionAid International. In January 2004, we moved our headquarters from London to Johannesburg, taking a first practical and symbolic step on a long journey of organizational internationalization. Today, ActionAid works with 15 million people in 45 countries to defeat poverty and achieve greater human rights. We are the only international development organisation headquartered in Africa, although others are now following. Internationalization changed ActionAid from being a largely European-based development organisation working in Africa, Asia and Latin America, into a global federation governed and run by equal members across the world. It wasn’t a case of simply shifting staff and resources to South Africa, but also of shifting organizational power. All our member countries, wherever they are based, have the same voting rights and voice as those based in the traditional donor countries of Europe, the US and Australia. This change, which was considered radical at the time, was driven by our desire to be consistent with our values of putting the poor and marginalised at the centre of our work. If we were serious about eradicating poverty and inequality in the developing world, we realized that we could not continue with a power structure that left only our richer members making critical decisions. Central to this idea, and to the entire internationalization debate, is our recognition that giving up power doesn’t mean having less power. Instead, decentralization and equality, for us, is about collectively having the right kind of power. By coming together on equal terms, we all develop a stronger collective voice. This transformation required a great leap of faith and mutual trust. There were anxious moments as Northern affiliates realised they had less control over their Southern counterparts, and there were understandable concerns about the implications for accountability to Northern donors. It was essential that we had robust systems in place, and that we ensured that our newly empowered members had the capacity to do the job, and use their decision authority for the ActionAid federation’s greater good. An effective International Secretariat was key in supporting these new members as well as ensuring coordination and fostering mutual accountability. The transition from a mainly appointed International Board to a General Assembly elected by its members took time. And although ActionAid UK lost power when it gave up ownership of ActionAid to the federation, it has an equal opportunity to influence decisions, and no longer must shoulder all the risks. Externally, we faced a number of challenges in establishing national organisations, including different national laws and legal frameworks for registering NGOs, restrictions on the membership of national boards, diverse cultures of governance—from national boards to assemblies—and different government attitudes towards NGOs. The process took longer than anticipated, but we succeeded through patient negotiation, adaptability, flexibility and, most importantly, building up national alliances to advocate on our behalf. To tackle the issues, institutions and processes that fuel poverty and injustice, we needed to start at the grassroots, and to walk the talk of power devolution. To tackle the issues, institutions and processes that fuel poverty and injustice, we needed to start at the grassroots, and to walk the talk of power devolution. Poverty cannot be eradicated by focusing only at a local or national level. Instead, the concerns and voices of those living in poverty should drive our plans and help increase our impact globally. Internationalization also helped increase our accountability to the people we work with, as well as our legitimacy within countries. Of course, internationalization has not been—and can never be—a one-off action or an end in itself. Over the years, we have continued to review and refine the process in order to improve our ways of working and to make us more effective. Last year we introduced a restructure that took internationalization a step further by delegating some functions to member countries previously provided by the ActionAid International Secretariat. Countries are now using their experience and expertise to lead on specific issues in the worldwide fight against poverty. 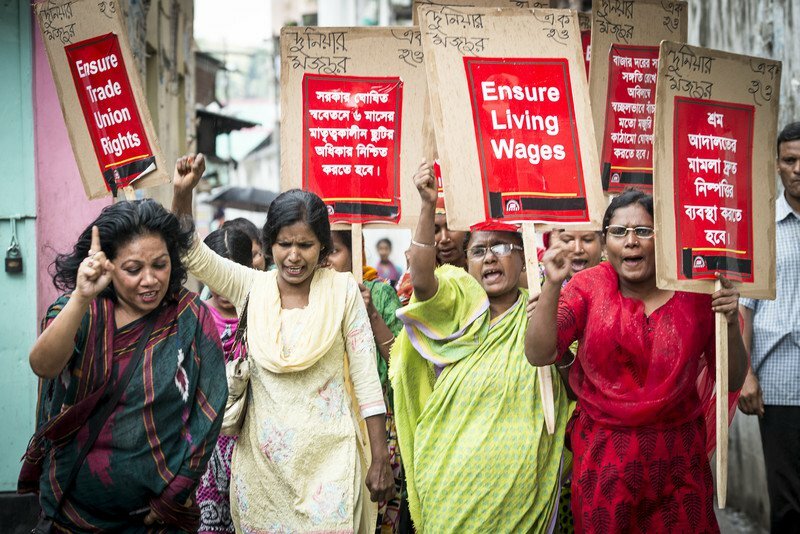 For example, ActionAid Bangladesh took on the leadership of our climate change and resilience work with ActionAid USA, while ActionAid Liberia leads our global campaign for safer cities for women. Increasingly, ActionAid International’s role is to facilitate greater cross-country working and collaborative activities. This decentralisation increases the responsibilities and power of developing world members within our global federation. It encourages more country-led research and advocacy linking the grassroots to the international level—a key element in our theory of change. ActionAid’s Tax Power campaign, for instance, extends from communities in Zambia demanding their government end tax incentives to multinational companies, to asking for more spending on health, education and other vital public services, to lobbying the G20 on global tax reform. We also invest in fundraising in middle-income and emerging market countries where a growing middle class offers great potential for generating funds. The signs are positive: individuals in Brazil, for example, are not just sponsoring children within their own country, but are also sponsoring children in Mozambique and Haiti. We are now raising funds within developing countries for other members of our federation. This is a major shift from ActionAid’s traditional funding model, which typically relied on Northern money for Southern activities. In Brazil, for example, we started fundraising in 2007, and covered our fund raising investments within a year. In traditional fundraising markets, recouping similar investments can take up to three years. In addition, our retention rate for new sponsors is relatively high in emerging markets—87% in India, and 78% in Brazil. This compares well with lower retention rates in traditional fund raising environments such as the US, UK, and other wealthy countries. We are, in essence, creating space for a renewed South-to-South form of internationalism. Civil society and the public in one global South country can contribute to changes elsewhere in the global South, either by contributing funds directly, or by influencing the external relations, cooperation, trade and investment policies of their own economies. ActionAid must continually keep an eye on changing global politics and economics. There is now greater mobilization and engagement in developing countries, even though the political space for civil society groups is shrinking. Technology is helping create an increasingly interconnected world with huge opportunities for solidarity campaigning, even though many countries are becoming more conservative and insular. In addition, the traditional fundraising markets in Europe and elsewhere have declined as a result of economic woes. People across the globe are closer than ever, but in other ways, the gap is increasing. However we change in the years to come, internationalization and decentralization will remain a core aspect of ActionAid’s work.